We have been out of guava jam for a few weeks now and the time had come to whip up a new batch. Actually, when John tasted it, he said that he thought it tasted a bit liked a tomato paste... to which I agreed. Not that it was bad... but it was similar somehow. Of course that lead us to wonder if they were related... tomato and guava. They are not...but we did discover that red guavas can be used as the base of salted products such as sauces, constituting a substitute for tomatoes, especially for those sensitive to the latter's acidity. In Asia, a tea is made from guava fruits and leaves. Guavas are plants in the myrtle family which contains about 100 species of tropical shrubs and small trees. Native to Mexico and Central America, South America and parts parts of the Caribbean and some parts of North Africa, guavas are now cultivated and naturalized throughout the tropics, and are also grown in some subtropical regions. 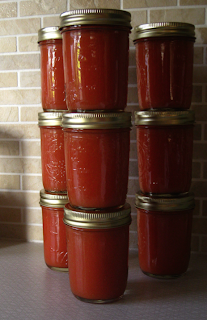 This week I made a new batch of guava jam that was particularly tasty I must say. 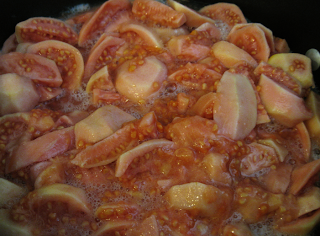 I prefer to make guava jam in the winter, because I find the fruit to have relatively no bugs compared to that of spring and summer. I harvested the guava over a 3 day period. Picking slightly green with a hint of yellow on the skin is what I prefer. I allow them to sit and ripen a bit more before peeling and storing in the fridge. Once I have filled a big kettle, I start the jam. Over the last 2 years I have learned how to make this process go much quicker. I don't know about most of you out there that make jams, but most recipes call for WAY TOO MUCH SUGAR. 5-6-7 cups? NO THANKS. I have never used more than 2 cups of sugar in any of my jams and they always come out just fine. In this batch I only used 1 1/2 cups. Peel Guava and quarter. Add about 1/ cup water. 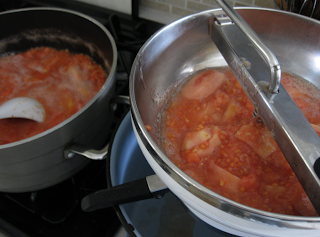 Cover and simmer until soft. 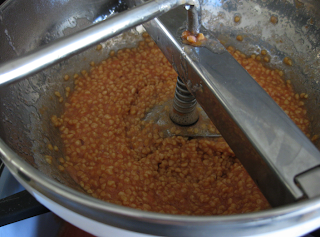 Ladel the cooked guava into a food mill to remove all seeds and any bits of skin. This is what you end up with after running through a food mill. The pulp and juice is all that remains in the bowl below the mill. Return the pulp to pot, add pectin, sugar and lemon juice. I slow cook mine on simmer for about 1- 1/2 hours until thick. Cooking longer will produce a darker color jam with a bolder taste. Many times there is a small amount of jam left over that will not fill a new jar. I had about a 1/4 cup leftover this time. 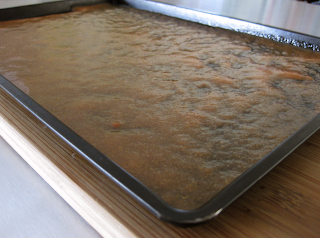 I take mine and pour a thin layer onto a cookie sheet that has been LIGHTLY coated with oil or non stick spray. Bake in a 200 degree oven for 1.5 hours. What you are doing is simply drying it out. 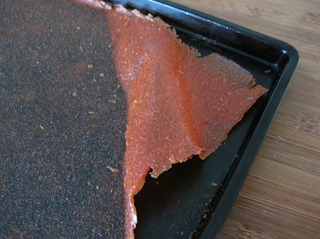 What a brilliant idea to use the bit of leftover jam to make fruit leather! Who would'a thunk?!? Conn would'a thunk!!! I also agree with you that most jam recipes call for waaaaaaay too much sugar, which can overwhelm the natural flavour of the fruit. I once happily received a gift jar of homemade strawberry jam. Gorgeously yummilicious looking stuff, it was. However, due to 'oversugarization' the jam was way too sweet and the taste of strawberries - negligible. It tasted more like Sugar Jam that happened to be red in color. Much less sugar = way to go! Actually, I MUST give credit for the fruit leather to your Dollinkdaughter Louie. She is the one who told me about it. I am just spreading the knowledge. My favorite is banana!!!! Someone gave a jar of Star Fruit Jam that a friend of theirs made... WAY TOO SWEET. So much so we don't touch it. John suggested using it as a glaze. I said "For what? POTTERY!" This is SO trashy of me, but I often prefer Goya's guava paste to membrillo. At parties I have been known to serve it with expensive aged cheeses from Murray's. 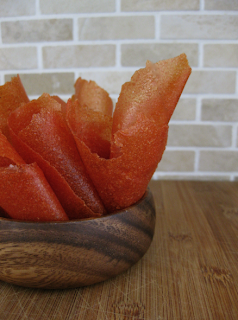 I have to believe that your fruit leather would be delicious wrapped around a bite-sized piece of Manchego. Aloha James... I have never used Guava paste.. and did not know what membrillo was until you mentioned it...but I do now thanks to google! Sounds like a future project here in the test kitchen. And I too believe that the fruit leather would be amazing around cheese.